Different types of private networks are distinguished based on their sizes (in terms of the number of machines), their data transfer speeds, and their reach. Private networks are networks that belong to a single organization. There are usually said to be three categories of such networks: LAN, or local area network; MAN, or metropolitan area network; and WAN, or wide area network. There are two other types of networks: TANs, or Tiny Area Network, which are the same as LANs but smaller, consisting of 2 to 3 machines; and CANs, or Campus Area Networks, which are the same as MANs, with bandwidth limited between each of the network's LANs. LAN refers to a group of computers that all belong to the same organization and that are linked within a small geographic area using a network and often the same technology (the most widespread being Ethernet). A local area network is a network in its simplest form. Data transfer speeds over a local area network can reach up to 10 Mbps, such as for an Ethernet network, and 1 Gbps, as with FDDI or Gigabit Ethernet. 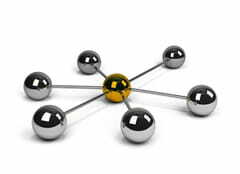 A local area network can reach as many as 100, or even 1000, users. By expanding the definition of a LAN to the services that it provides, two different operating modes can be defined: in a "peer-to-peer" network, in which communication is carried out from one computer to another, without a central computer, and where each computer has the same role; or in a "client/server" environment, in which a central computer provides network services to users. MANs connect multiple geographically close LANs (over an area of up to several dozen miles) to one another at high speeds. Thus, a MAN lets two remote nodes communicate as if they were part of the same local area network. A MAN is made from switches or routers connected to one another with high-speed links (usually fibre optic cables). A WAN connects multiple LANs to one another over great geographic distances. The speed available on a WAN varies depending on the cost of the connections, which increases with distance, and may be low. WANs operate using routers, which can "choose" the most appropriate path for data to take to reach a network node. The most well-known WAN is the Internet. Latest update on June 14, 2018 at 01:48 AM by Olivia Long. This document, titled "Types of Networks," is available under the Creative Commons license. Any copy, reuse, or modification of the content should be sufficiently credited to CCM (https://ccm.net/).